The following graph shows the unemployment rate in the US from 1869 to 1899 (Blogger has cut off the right edge, but the graph data is still clear). 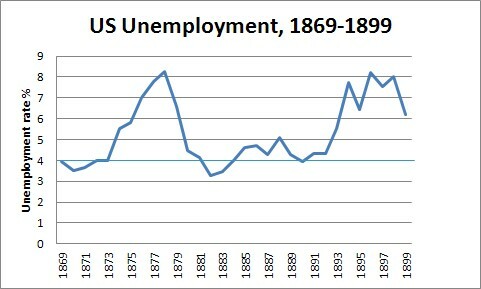 The estimates are taken from Vernon (1994), although other estimates for the 1890s put unemployment at higher levels. The blue line at 4% is the upper limit of full employment, which is usually defined as less than 1% up to 4%. Rarely did unemployment fall below 4% in the late 19th century. Of especial interest is the spike in unemployment from 1875–1878, for the real GNP estimates of Balke and Gordon show positive GNP growth rates in these years. What went wrong with the US economy? One possibility is that the real GNP estimates of Balke and Gordon are wrong. This data is presented below in graph form. You can see the manufacturing recession and subsequent stagnation. From 1873, industrial output fell, mildly in 1874, but sharply in 1875. Davis (2004: 1203) finds that the cumulative industrial index loss (-10.83) was the second worst of the late 19th century, and only surpassed by the double dip recession of the 1890s. By the 1870s the industrial sector of the US economy was large enough to be a good index of real GDP movements, and Davis finds that the US had a recession from 1873 to 1875 lasting less than 3 years. A brief recovery in industrial output happened in 1876, but there was stagnation in 1877. So, all in all, the rising unemployment until 1878 looks like the result of a severe recession from 1873 to 1875, poor recovery, and then stagnation in 1877 (perhaps a double dip recession in the mid to late 1870s is another possibility). Balke, N. S., and R. J. Gordon, 1989. “The Estimation of Prewar Gross National Product: Methodology and New Evidence,” Journal of Political Economy 97.1: 38–92. Davis, Joseph H. 2004. “An Annual Index of U. S. Industrial Production, 1790-1915,” The Quarterly Journal of Economics 119.4: 1177–1215. Davis, Joseph H. 2006. “An Improved Annual Chronology of U.S. Business Cycles since the 1790s,” Journal of Economic History 66.1: 103–121. Vernon, J. R. 1994. “Unemployment Rates in Post-Bellum America: 1869–1899,” Journal of Macroeconomics 16: 701–714. This seems appropriate in light of this post at Robert Murphy’s blog. It is well known that Wicksell’s unique “natural rate of interest” was taken over by Mises and Hayek in their early formulations of the Austrian business cycle theory (ABCT). “Put concisely, Wicksell’s theory is as follows: If it were not for monetary disturbances, the rate of interest would be determined so as to equalize the demand for and the supply of savings. This equilibrium rate, as I prefer to call it, he christens the natural rate of interest. In a money economy, the actual or money rate of interest (“Geldzins”) may differ from the equilibrium or natural rate, because the demand for and the supply of capital do not meet in their natural form but in the form of money, the quantity of which available for capital purposes may be arbitrarily changed by the banks. Now, so long as the money rate of interest coincides with the equilibrium rate, the rate of interest remains “neutral” in its effects on the prices of goods, tending neither to raise nor to lower them. When the banks, however, lower the money rate of interest below the equilibrium rate, which they can do by lending more than has been entrusted to them, i.e., by adding to the circulation, this must tend to raise prices; …” (Hayek 2008 : 215). (1) The “natural rate of interest” is a non-monetary theory of the interest rate, and is independent of money and credit (Rogers 1989: 27). It is supposedly the centre of gravity towards which the monetary rate converges (Rogers 1989: 27). (2) The condition where loans are made in natura is a barter state (or, more correctly, a credit/debt transaction where real goods are lent out, and then repayed with interest in terms of other goods later). What would a rate of interest be when loans are made in goods? The “natural rate of interest” would be the rate on loans of a physical commodity or commodities (Sraffa 1932: 49–51). In a world of heterogeneous capital goods which is out of general equilibrium, there could be as many natural rates on each commodity considered as a capital good as there as such commodities (Barens and Caspari 1997: 288). (3) The significant thing is that the “natural rate” is an “equilibrium rate” for Hayek: it is the rate that clears the various loan markets for real goods lent out as capital goods (whether durable or non-durable capital). These capital loan markets in natura – the markets in real capital goods lent out without money – will have market clearing with a natural rate. “One thing is clear: when Hayek and Sraffa use the word ‘equilibrium’ they use it to denote quite different things. For Hayek it means market-clearing demand-and-supply equilibrium, for Sraffa long-run cost-of-production equilibrium.” (Lachmann 1994: 153). (4) Therefore real savings and investment are equated: no intertemporal discoordination (or future lack of capital goods in relation to current plans) will result. But the natural rate of interest can only be a single rate inside general equilibrium (or in some other equilibrium state such as Mises’s “final state of rest” or the ERE). Outside of general equilibrium, there can be as many natural rates as there are capital goods commodities lent out. (6) therefore (by the internal logic of Hayek’s theory) no monetary system where capital goods investments are made by means of money can hit the right multiple natural interest rates either on each in natura loan of various capital goods, because the banks’ monetary interest rates – even in a free banking system – converge in a spread, yet there could be vast differences between the spread of banks rates and many individual commodity natural rates. (7) According to the logic of Hayek’s theory, it follows that there is therefore no way in principle for a monetary system of lending for capital goods purposes to achieve ideal or consistent intertemporal coordination. The only way is: to abolish money and return to a barter system (but even then there is no reason why “own commodity equilibrium rates” must exist on each type of capital good available for investment). (8) Furthermore, the whole theory is dependent on unrealistic assumptions about real world tendencies to general equilibrium. There is no reason to think that there are equilibrium interest rates that will clear all loan markets just waiting to be discovered by entrepreneurial activity. A possible and likely mismatch between planned investment and available real future savings is perfectly possible in a world of uncertainty, subjective expectations, entrepreneurial error, and even investment financed via retained earnings. But question is: do these possible intertemporal discoordination problems really cause severe economic problems in real world market economies, and do they produce the type of trade cycle imagined in the Austrian business cycle theory? The Austrian business cycle theory requires that booms develop with full employment and a lack of resources, but ignores the fact that virtually all modern economies are open to international trade and even at full employment still have idle capacity in many sectors (which overcome scarcity problems for many investments made in the past). The theory requires a full use of resources (modelled in a closed economy) that only really occurs in fictitious states of general equilibrium. The theory also requires a real world tendency to general equilibrium that does not exist in modern market economies. “The Natural Rate of Interest: A Wicksellian Fable,” June 6, 2011. “Austrian Business Cycle Theory (ABCT) and the Natural Rate of Interest,” June 18, 2011. “Austrian Business Cycle Theory: The Various Versions and a Critique,” June 21, 2011. “Hayek on the Flaws and Irrelevance of his Trade Cycle Theory,” June 29, 2011. “Robert P. Murphy on the Sraffa-Hayek Debate,” July 19, 2011. “Bibliography on the Sraffa-Hayek Debate,” July 20, 2011. “Robert P. Murphy on the Pure Time Preference Theory of the Interest Rate,” July 13, 2011. “Lachmann on Trade Cycle Models,” August 27, 2011. “ABCT without a Unique Natural Rate of Interest?,” September 22, 2011. “ABCT and the Flow of Credit,” October 6, 2011. “Hayek’s Natural Rate on Capital Goods, Sraffa and ABCT,” December 27, 2011. “Equilibrium Amongst the Austrians,” January 28, 2012. “Hülsmann on Mises’s Business Cycle Theory,” February 11, 2012. “Why Isn’t the Boom of 1946-1948 a Problem for Austrians?,” June 2, 2012. “Bruce Caldwell on the Flaw in Hayek’s Early Business Cycle Theory,” July 8, 2012. “Repapis on Hayek’s Business Cycle Theory,” October 10, 2012. “Hayek on his Simplified Capital Theory Assumptions in Prices and Production,” October 15, 2012. “Critics of the Classic Hayekian Business Cycle Theory,” December 13, 2012. Barens, I. and V. Caspari, 1997. “Own-Rates of Interest and Their Relevance for the Existence of Underemployment Equilibrium Positions,” in G. C. Harcourt and P. A. Riach (eds. ), A “Second Edition” of The General Theory (vol. 1). Routledge, London. 283–303. Hayek, F. A. von, 2008. Prices and Production and Other Works: F. A. Hayek on Money, the Business Cycle, and the Gold Standard. Ludwig von Mises Institute, Auburn, Ala.
Lachmann, L. M. 1994. Expectations and the Meaning of Institutions: Essays in Economics (ed. by D. Lavoie), Routledge, London. 141–158. Rogers, C. 2001. “Interest Rate: Natural,” in P. Anthony O’Hara (ed. ), Encyclopedia of Political Economy. Volume 1. A–K. Routledge, London and New York. 545–547. Sraffa, P. 1932. “Dr. Hayek on Money and Capital,” Economic Journal 42: 42–53. (Boyer and Hatton 2002: 667). (1) Full employment is usually defined as any percentage less than 1% up to about 4% unemployment (< 1–4%). The late 19th century only had full employment from 1871–1875 and in 1890, and always at the upper range of 2.7–4%: in all other years, unemployment ran at over 4%. So much for the wonderful glories of gold standard capitalism! Some particularly bad periods of unemployment were 1876–1880, 1884–1888 and 1892–1896. The 1876–1880 unemployment figures are very strange, because the real GDP estimates for this period (see Appendix) show real output growth in all years but 1879. As in the case of the US, something went badly wrong with Western capitalist economies in the mid to late 1870s. My guess is that debt deflationary dynamics were at work. The 1890s look like a good candidate for another serious economic crisis (as was the case in the US), and there was a serious recession in the UK from 1891 to 1893. (2) The UK had a very serious unemployment problem through both the 1920s and 1930s. The Great Depression was already preceded by high levels of unemployment. (3) The period from 1946–1973 had the lowest rates of unemployment in any period. It is the hands down winner. I have highlighted it in green. This is what full employment looks like. The average unemployment rate in these years was 2.01%, and in many years unemployment was less than 2%. This was the era of Keynesian full employment fiscal policy – what we now call “the golden age of capitalism.” We can look back on it wistfully and see what a disaster the subsequent period of neoliberalism was in terms of unemployment and opportunities for growth. (4) The data from the 1980s confirms starkly (if we really needed it confirmed) that Thatcherism was one of the worst periods in British economic history. In terms of unemployment, it was close to the levels of the Great Depression. (5) Even the 1990s recession had fairly severe unemployment: in the order of 10–13%. (Maddison 2003: 47, 49, 51). Maddison, Angus. 2003. The World Economy: Historical Statistics. OECD Publishing, Paris. Yes, that title is facetious, but I will explain its meaning. If a private billionaire built a pyramid that took 70% of the GDP of his nation (say, when the economy was at full employment), and thereby impoverished the rest of his community, then would a Rothbardian libertarian object to such a project? In fact, the natural rights ethics of Rothbard would require that nothing should be done coercively to prevent the billionaire from any such enterprise: after all, he is satisfying his subjective utility preferences, and if the government stepped in and stopped him, that would be an outrageous evil violation of economic freedom! Yet Keynes is unfairly slandered for having allegedly seriously advocated pyramid building or ditch digging (although he never did such a thing). “If – for whatever reason – the rate of interest cannot fall as fast as the marginal efficiency of capital would fall with a rate of accumulation corresponding to what the community would choose to save at a rate of interest equal to the marginal efficiency of capital in conditions of full employment, then even a diversion of the desire to hold wealth towards assets, which will in fact yield no economic fruits whatever, will increase economic well-being. In so far as millionaires find their satisfaction in building mighty mansions to contain their bodies when alive and pyramids to shelter them after death, or, repenting of their sins, erect cathedrals and endow monasteries or foreign missions, the day when abundance of capital will interfere with abundance of output may be postponed. ‘To dig holes in the ground,’ paid for out of savings, will increase, not only employment, but the real national dividend of useful goods and services. It is not reasonable, however, that a sensible community should be content to remain dependent on such fortuitous and often wasteful mitigations when once we understand the influences upon which effective demand depends.” (Keynes 1964 : 219–220). This is a much misunderstood passage. The meaning is not what libertarians allege. It is not even the government that is imagined building pyramids here, but a private sector millionaire. In these rhetorical sentences, Keynes is noting that the private sector is perfectly capable of engaging in creating certain goods which per se are wasteful, but in a depression would increase employment and income, and via the money incomes spent by the newly employed people would stimulate further demand for other goods and services. In a deep recession, millionaires might indeed employ people to build “mighty mansions” or pyramids “to shelter them after their death” (obviously Keynes is being rhetorical here) or erecting cathedrals or monasteries. Would this private sector spending – in a depression – reduce unemployment? Yes. Would it indirectly increase demand for other goods and services as workers spent their income on consumption? Yes – of course assuming the construction was not some outrageous percentage of GDP, as in my example above (where its long-term effects would obviously draw factor inputs and labour away from industries producing consumption goods and capital goods, impoverishing the community). In fact, in a deep depression even if the private sector millionaires employed people to dig holes in the ground, this would reduce unemployment and indirectly increase demand for other goods and services (“the real national dividend of useful goods and services”). It is not reasonable, however, that a sensible community should be content to remain dependent on such fortuitous and often wasteful mitigations when once we understand the influences upon which effective demand depends.” (Keynes 1964 : 219–220). That is to say, it is utterly unreasonable and stupid to simply wait for the private sector to end a depression by pyramid building or really digging ditches (or have a government do these things), and the private sector too is perfectly capable of producing things that in and of themselves are inherently wasteful goods. Pyramids and ditch digging would be wasteful per se (even though indirectly they would increase employment and demand for other products). In other words: it’s better to end a depression by having socially and economically useful government spending – public investment and public works – than just waiting for the private sector spending, some of which might actually be wasteful. But, curiously, just imagine our Rothbardian libertarians: if in a depression (or at full employment) some billionaires in a nation did decide to build pyramids on a scale far greater that anything Keynes imagined (as Keynes probably thought of such an example as, at most, constituting a small stimulus of 1–2% of GDP), what would they say? Even if a billionaire wanted to construct pyramids that would take 70–80% of GDP, Rothbardians would in the end have no reason to coercively stop or prevent any such activity. In fact, it is likely they would strongly defend the right of the billionaires to build such huge and inherently wasteful structures. They would in the end be defenders of wasteful pyramid building. And we do not have to look far in the real world for examples of privately produced goods that, arguably, could be regarded as wasteful per se: private jet planes that do little except add to air pollution and congest airports; luxury sports cars or other vehicles that are highly fuel-inefficient and that contribute to traffic jams and urban pollution. But do libertarians doubt that the production of these things adds to employment and the income spent by workers who produce them drives demand for other goods? And, no, I do not advocate banning such things, but one can certainly impose high taxes on some luxury goods that have serious negative externalities. (2.2.2) second-hand real goods with a moderate to high elasticity of production, bought for consumption (though sometimes for investment purposes), e.g., second hand book stores, used cars, etc. * Sometimes financial assets are called “capital assets,” but I find this very confusing, as that latter term is better left for real capital goods considered as assets. Goods and services in (1) are normally reproducible, which means that demand for such goods and services induces more employment and output in a market economy. Assets in (2.1) and (2.2.1) are generally non-reproducible: that is, businesses do not hire a significant number of workers or factor inputs when demand for these assets rises. Asset bubbles normally occur in asset classes (2.1) and (2.2.1), but housing seems to be an important exception. Asset class (2.2.1) includes things like gold, antiques, or famous works of art. Financial assets on secondary financial asset markets (2.1) have a low elasticity of production. When demand rises for stocks and shares, businesses do not employ workers to make more stocks and shares: demand changes frequently and significantly for these assets, but the supply is more or less fixed (hence the price volatility). The question of real estate and houses is a curious one: one could think of real estate as having a low or moderate elasticity of production, depending on the economy, time and place. For example, one could probably argue that urban real estate in Japan during the bubble of the 1980s to early 1990s had a relatively low elasticity of production. But in a nation or region where there is a substantial amount of land (private or public) land that can be subdivided, developed and sold off (involving some degree of increase in employment), one might (possibly) say that real estate has a moderate elasticity of production. Housing, I suspect, can be said to have a high elasticity of production. Occasionally, of course, you can have other asset bubbles in (2.2.2): think of the Dutch Tulipmania (1636–1637). A further crucial idea is this: a good could have a zero (or near zero) elasticity of production, but an elastic supply: e.g., fiat money and private credit money. “Keynes on the Special Properties of Money,” May 8, 2011. “Gold as Commodity Money and its Elasticity of Production,” November 18, 2011. “More on the Gross Substitution Axiom,” July 28, 2011. * This includes foreign exchange turnover and stock market trading (excluding bonds and other over-the-counter transactions). What is significant about this? The significance is that global GDP is dwarfed by the value of major financial asset market transactions. A vast amount of spending that occurs every year is on secondary financial markets, including markets where foreign exchange, stocks, and shares are sold. I assume that some of this $900 trillion involves foreign exchange transactions for international trade and so on (that is, for purchases of goods and services), but it is estimated that over 90% of foreign exchange transactions are speculative. At any rate, the total value of world trade (merchandise exports plus commercial services) was about $16.9 trillion in 2007, but not all of this required foreign exchange transactions (e.g., trade between nations in the Eurozone involves countries using the same currency, the Euro). Moreover, given that over-the-counter transactions and bond trading is excluded from the estimate above, it is obviously an underestimate of the real global aggregate value of such trading. Any economic theory that ignores this type of spending and its sector of the economy (i.e., the secondary financial asset markets) is deeply flawed and liable to be missing something fundamental about modern market economies. In any one year, money can get sucked into this world of financial asset market transactions and essentially trapped there for a significant period of time as it is used to buy and sell assets over and over again. Spending on the secondary financial asset markets is essentially a type of transaction that does not induce employment in the way that spending on final goods and services does. Most financial assets are non-reproducible, in the sense that businesses do not hire a significant number of workers or factor inputs when demand for these assets rises (Davidson 2002: 44), for they already exist in vast quantities in many different countries. This type of spending is also a fundamental reason why Say’s law is one of the most ridiculous ideas ever formulated by economists. “there are ... resting places for saving other than reproducible assets [i.e., final goods and services – LK]. In our model this is money. But land, as Keynes to his credit understood, would have just the same consequences and so would Old Masters. It is therefore not money which is required to do away with a Say’s Law-like proposition that the supply of labour is the demand for goods produced by labour. Any non-reproducible asset will do. When Say’s law is correctly formulated for an economy with non-reproducible goods it does not yield the conclusions to be found in textbooks. As I have already noted Keynes was fully aware of this and that is why he devoted so much space to the theory of choice amongst alternative stores of value.” (Hahn 1977: 31). As individuals become richer and richer, the less likely it is that their income will be spent on final goods and services. That is to say, the wealthy have a lower marginal propensity to consume than poor classes of people. So what do the rich and ultra-rich mostly spend their money on? The answer is: mostly assets on secondary financial markets (either directly or, more likely, indirectly via financial institutions). This is why there is no necessary reason for Say’s law to hold true in any modern capitalist economy. “Every producer [= capitalist] asks for money in exchange for his products, only for the purpose of employing that money again immediately in the purchase of another product; for we do not consume money, and it is not sought after in ordinary cases to conceal it: thus, when a producer desires to exchange his product for money, he may be considered as already asking for the merchandise which he proposes to buy with this money. It is thus that the producers, though they have all of them the air of demanding money for their goods, do in reality demand merchandise for their merchandise.” (Say 1816: 103–105). When you believe (like Say) that capitalists only ever spend their money on goods and services (whether consumption goods or factor inputs for further production), it is a recipe for disastrous economic theory. It occurs to me that I should have mentioned another source of non-employment inducing demand: spending on real assets with low or relatively low elasticities of production (e.g., gold). As one moves to real assets with moderate to high elasticities of production, the story is different, of course. Furthermore, one might reply with the question: why is it that during asset bubbles, economies tend to have booms? But the booms associated with asset bubbles tend to be driven by the modern financial system and its creation of credit to fuel asset bubbles, consumption and investment, with a positive wealth effect amongst owners of the assets whose price is rising (either more consumption out of income or credit). Capitalists are caught up in the boom via their optimistic expectations. If in a recession demand to hold money increases and demand to hold non-reproducible financial assets also rises (by using money to buy them), we have in the latter case exactly what can be called non-employment inducing demand. Davidson, P. 2002. Financial Markets, Money, and the Real World. Edward Elgar, Cheltenham. Hahn, F. H. 1977. “Keynesian Economics and General Equilibrium Theory: Reflections on Some Current Debates,” in G. C. Harcourt (ed. ), The Microeconomic Foundations of Macroeconomics Macmillan, London. 25–40. Say, J. B. 1816. Catechism of Political Economy, or, Familiar conversations on the manner in which wealth is produced, distributed, and consumed in society (trans. J. Richter). Sherwood, Neely, and Jones, London. I find all the endless debate about the merits of a minimum wage tiresome and mostly a waste of time. Why? Let me put the case for a minimum wage in the easiest form I can imagine. Suppose we concede that minimum wages will cause some significant degree of unemployment (and, yes, this concedes a lot to the opponents of the minimum wage that I don't actually think needs to be conceded). First, one of the major arguments for a minimum wage is a moral one: people should not be working for wages under the poverty line. The minimum wage is the wage below which people start to struggle to live: they must face an existence below the poverty line. Minimum wages are set roughly at the poverty line, but ideally slightly above it. Many state real (inflation-adjusted) minimum wages in the US have fallen below the poverty line, and for a long time now (Pollin et al. 2008: 17). Secondly, a decent society does not let its unemployed starve: it gives them (ideally) a decent unemployment benefit. So, even if you think that a minimum wage will cause some degree of unemployment amongst youth, that is not a disaster. In that respect, a minimum wage might be rather like health and safety regulations or regulations on pollution, which might cause some unemployment too, given that they raise the costs of doing business. But this is called civilisation, a tradeoff for more civilised life. Thirdly, will youth unemployment really be a problem if the economy is run properly? Not if we really had full employment, Keynesian fiscal policy: whatever unemployment that resulted from a minimum wage would be swamped by the effects of massive government fiscal policy. Unemployment would be low. If you do not believe that argument, then why in the classic era of Keynesianism (1946-1970s) when minimum wages were generous (often above the poverty line in many countries), did we have very high employment? - indeed historically unprecedented high employment. Also, as I have said above, my argument concedes a lot to the opponents of the minimum wage. But I do not need to concede much of what I have conceded. People can cite empirical evidence that minimum wages have caused some higher degree of youth unemployment in such-and-such a region or state at such-and-such a time, but other empirical evidence can be cited that disputes this. There is another objection that has been going the rounds (mostly on libertarian blogs): if we make the minimum wage $9, then why not $900? That objection is, quite frankly, brainless. The minimum wage is a floor concept: the floor is roughly the poverty line (or slightly above it). That is where you set it, and not well above it. Not even Post Keynesians deny that excessive wage increases can feed into cost push inflation – wages being a big factor in input costs. But a rise from, say, $7.25 to $9 is quite small. In the real world, whole swathes of the market have corporations and businesses that actively set prices and control them by price administration. They leave prices unchanged for significant periods of time, even when mild to moderate demand changes happen, or even when mild price increases affect their factor input costs. Of course, it could be said in reply that most businesses that are affected by the minimum wage are small businesses. Yet small business is not really the source of cost push inflation: the real cause is serious increases in factor input costs amongst the medium-scale and large corporations. And many small businesses face much greater competition than large corporations, and their prices are constrained to a great extent by the need to compete. Pollin, R., Brenner, M., Wicks-Lim, J. and S. Luce. 2008. A Measure of Fairness: The Economics of Living Wages and Minimum Wages in the United States. Cornell University Press, Ithaca, NY. Was the 20th Century Really the Most Violent? That is the question posed and answered by Steven Pinker (Pinker 2011: 193–200), and his answer is likely to startle many people. First, let us consider the man depicted in this painting below. You might recognise him already. This is Genghis Khan (c. 1162–1227), and the evidence would suggest that he rivalled the worst 20th century dictators in the number of people killed during his wars of conquest. Of course, in terms of absolute numbers, no one doubts that the 20th century was the most violent in human history. Yet immediately one must point out that the 20th century also had a greater population than any previous century. The question “how violent is this war compared to that war?” requires per capita death rates, not absolute numbers. The table below ranks the most violent episodes in Medieval and Modern human history, and all dates are AD. The third column (“Est. Death Toll”) shows the estimated death toll in millions, and the fourth column (“Adjusted Death Toll”) shows us what the death toll would have been for any conflict before the 20th century, but adjusted for the 20th century population. That is to say, if Tamerlane had lived in the 20th century, and his conquests had occurred with the same per capita death rate as they did in his own time, how many people would have died? (21) Chinese Civil War | 20th | 3 | 3 (Pinker 2011: 195). (1) Some of these atrocities were mostly caused by man-made (or preventable) famine, e.g., the death toll for Mao Zedong and British India. What is most remarkable is that of the top 10, only the Second World War makes it onto that list, and only at number (9) in terms of per capita death rates. All the other 10 most violent events of human history did not even occur in the 20th century. The most murderous events of human history were the An Lushan Revolt in the 8th century AD China, and the Mongol Conquests of the 13th century AD. 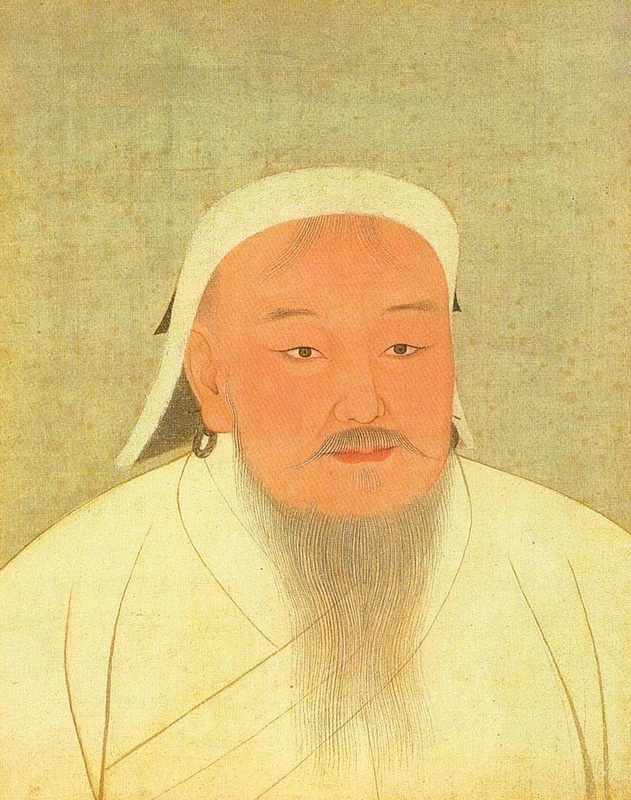 The death toll from the Mongol Conquests was very high, and the 20th century equivalent would have been a conflict in which 278 million people died. By contrast, the Second World War killed some 55 million people. That would make Genghis Khan one of the worst monsters of history, and the eruption of essentially stateless nomads from the Eurasian steppe one of most violent events of human history. Nor were the Mongols the first such invaders. Sedentary agricultural peoples down through the centuries – in Europe, the Near East and China – have been terrorised by steppe nomads many times in human history: we need only think of the (often stateless) Scythians, Sarmatians, Goths, Huns, Bulgars, Avars, Magyars, Tartars, Cumans, Khazars, Mughuals and Manchus. The wars of such people are remarkably consistent with Pinker’s thesis about higher levels of violence in stateless and tribal societies as compared with state-based societies. Pinker, Steven. 2011. The Better Angels of our Nature: Why Violence has Declined. Viking, New York, NY. Robert Skidelsky, “The Rise of the Robots,” Project-syndicate.org, February 19, 2013. Some people complain that Skidelsky is being a Luddite, but that is utterly unfair, as he does not oppose automation per se. If you accept that market economies have no tendency to full employment equilibrium, then it follows logically that large-scale automation is most likely to cause serious structural unemployment and a chronic aggregate demand shortfall. And it will not do to say, “oh, well, enough new jobs will be created designing and maintaining the machines.” For a while they might. But the inexorable march of artificial intelligence means that eventually there is no reason why machines will not design and maintain other machines. Machines will eventually design, manufacture, test and provide maintenance for new generations of machines, with minimal human supervision. (1) Pinker points to a remarkable trend over the past 8 centuries or so: from the late Middle Ages onwards homicide rates have plunged in Western Europe (but the trend is also visible in Western offshoots). The long term trend was most pronounced from about 1300 to 1700, where rates fell from about 50–100 per 100,000 to about 10 per 100,000 (Pinker 2011: 63). Furthermore, for the period before 1800 the current data from historical records are likely underestimates, so the downward plunge was probably much greater. Nor can we attribute the spectacular trend to the effects of modern medicine, for effective, science-based medicine is an invention of the 20th century, and most of the decline happened before 1700 when medical science was very crude, and doctors possibly “killed as many patients as they saved” (Pinker 2011: 62). And the general trend continued to the present day, in which homicide rates are about 1 per 100,000 in many Western European nations (with a range in individual nations from 0.3-2 per 100,000). Notably, the death penalty has been abolished in Western Europe (and indeed virtually all of Europe except Belarus, and other dubious cases like Russia where it has been “indefinitely suspended” but legally allowed). Remarkably, some small states like Iceland and Monaco have recently had some years with zero homicide rates. (2) As an aside, the average homicide rate in the Middle Ages in Europe was still lower than Pinker’s average for non-state societies (524 per 100,000; Pinker 2011: 63). (3) Interesting observations in the data can be found: men are responsible for 92% of violence (Pinker 2011: 63), and most of these were males between 15–30 (Pinker 2011: 104). Until recently, rural areas were much more violent than cities (Pinker 2011: 63). (4) Pinker attributes the violence in Medieval Europe partly to its fragmented political organisation: by the late Middle Ages the central governments of kingdoms were very weak (Pinker 2011: 67). This is a crucial point that Pinker does not develop, but I can do so here: feudalism, politically speaking, resembles anarcho-capitalism and other stateless right libertarian ideologies. Feudalism in its political sense means, not the manorial system or serfdom, but a system of private contractual arrangements where political power and its associated tasks of defence and justice are contacted out to lords and feudal vassals (Freeman 2002: 147–148). Local political power, justice and defence had essentially been “outsourced” through feudalism (Pinker 2011: 67): the private power of feudal lords was overwhelming. In fact, the kingdoms were divided into vast collections of competing duchies, counties, minor principalities, feudal lords and knights, who were constantly at war: indeed they were little more than warlords. The result? Fairly terrible and frequent wars where civilians were not spared (Pinker 2011: 67). The homicide rate in the Middle Ages might have been about 100 per 100,000. Astonishingly, the everyday carnage in late Medieval society was only somewhat lower than the death rate per capita in modern Communist China (1949–1987) which was 120 per 100,000 (Cooney 1998: 58), a country which had a civil war, the Cultural revolution and a terrible man-made famine (1958–1962). The Leviathan state brought an end, if not to all elements of the feudal system, at least to the previous political fragmentation and anarchic violence (Pinker 2011: 74). Europe had 5,000 political units in the 15th century, 500 by the early 17th century, 200 by the time of Napoleon, and by 1953 fewer than 30 (Pinker 2011: 74). A new “King’s peace” emerged within national and quasi-national states as central government reasserted itself and law and order was imposed. Remarkably (at least to the modern mind), murder was in many societies not even a criminal offence – that is, a crime against the state (or against the public good) – in many medieval and tribal societies. Murder was merely an aspect of private law (or “civil law”), in which two relevant parties would negotiate, and the victim’s family would demand “wergild” (“man-money”) from the perpetrator’s (Pinker 2011: 74). If not, revenge killings and blood feuds were the norm. Medieval kings like Henry I of England made murder a crime against the state, and provided at least the beginnings of a modern justice system, by sending his court officials out to punish murder (Pinker 2011: 74–75). In this respect, justice came to be “nationalised” (Pinker 2011: 74). (3) “gentle commerce” (a modern market economy). We have already discussed the Leviathan state above in (4). The cultural changes consisted of a new culture of more restrained impulses and self-control, a movement embodied in the drive towards “courtly” manners (“courtesy” originally meant civilised behaviour at court). This originated from royal courts, downwards to the nobility and even to the middle classes and common people. “The two triggers of the Civilizing Process—the Leviathan and gentle commerce—are related. The positive-sum cooperation of commerce flourishes best inside a big tent presided over by a Leviathan. Not only is a state well suited to provide the public goods that serve as infrastructure for economic cooperation, such as money and roads, but it can put a thumb on the scale on which players weigh the relative payoffs of raiding and trading …. The two civilizing forces, then, reinforce each other, and Elias considered them to be part of a single process. The centralization of state control and its monopolization of violence, the growth of craft guilds and bureaucracies, the replacement of barter with money, the development of technology, the enhancement of trade, the growing webs of dependency among far-flung individuals, all fit into an organic whole.” (Pinker 2011: 77–78). The expanding market economy was made possible by the Leviathan state’s imposition of a new peace, law and order, provision of basic infrastructure, and things such as national currencies. (6) Pinker looks at the class issues related to the decline in European violence. In the Middle Ages, rich people were as violent as the poor or even more so (Pinker 2011: 81). Today violence is mostly committed by lower socio-economic classes (Pinker 2011: 82). The trend was for elite violence to fall from the Middle Ages onwards. Why? Pinker sees some cultural reasons (the militarised aristocratic culture faded away), but above all the rich and middle classes have the best and easiest access to the justice system, and to the state-based resolution of conflict. “The most common motives for homicide are moralistic: retaliation after an insult, escalation of a domestic quarrel, punishing an unfaithful or deserting romantic partner, and other acts of jealousy, revenge, and self-defense.” (Pinker 2011: 83). Pinker then points out that many modern criminal classes are beyond the law precisely because they are involved in illegal activities and cannot (by definition) resolve conflicts by means of the state. They are, in a word, stateless. They resolve disputes by violence. So Pinker sees the persistence of some violence as the result of violence being relegated to the “socioeconomic margins” (Pinker 2011: 85). (8) Pinker proceeds to show precisely how it was that those regions escaping effective control by the early modern European state continued to have endemic violence: the inaccessible hinterlands and mountains (Pinker 2011: 87). Furthermore, those modern nations with the highest rates of violence are those where states have become dysfunctional, have collapsed, or where stateless tribal societies really do persist beyond the reach of an effective state (Pinker 2011: 85). Freeman, Samuel. 2002. “Illiberal Libertarians: Why Libertarianism is not a Liberal View”, Philosophy and Public Affairs 30.2: 105–115. ... is described in a quotation from Steven Pinker’s The Better Angels of our Nature (2011). Pinker quotes the late Medieval/Early Modern scholar and humanist (and all round nice guy) Desiderius Erasmus (1466–1536). Erasmus wrote a work called De civilitate morum puerilium (On Civility and Good Manners in Youth). The word puerilium, though it can refer to children, can also mean “youths”. Once gets the sense that the book was directed not just at teenagers but at young men – knights and other youth who were entering royal courts and polite society at this period. OK, if you haven’t burst into an uncontrollable fit of laughter by now … well, I’m disappointed. I am reading Steven Pinker’s The Better Angels of Our Nature (2011) at the moment, and a curious passage leaps out from the pages. “Those who prefer real-world experiments to sophisticated statistics may take note of the Montreal police strike of 1969. Within hours of the gendarmes abandoning their posts, that famously safe city was hit with six bank robberies, twelve arsons, a hundred lootings, and two homicides before the Mounties were called in to restore order.” (Pinker 2011: 122). I am sure some people (perhaps not just libertarians) might scoff at the notion that Western societies would descend into anarchy if police services were temporarily suspended, but the interesting real world experiment above makes you wonder. Obviously, one can point the finger at petty hoodlums or professional criminal classes who are normally deterred by the police, but what would happen as law abiding people were forced to defend themselves as this sort of disorder continued? For example, some libertarians point to episodes where traffic lights go on the blink and (they claim) some kind of spontaneous order develops in traffic flows. Well, maybe that happens, but what would happen if the police were to disappear? I doubt whether “spontaneous order” would result. Nor is the Montreal example the only instance of a real world experiment in what happens when the Leviathan state’s provision of law and order is taken away: in 1923 half the police force in Melbourne (Australia) went on strike, and within days the city had riots and looting. In Brazil in 2012, a police strike set off a crime wave. If nothing else, the lesson is: the labour disputes of the police should be taken seriously! Steven Pinker seems to have come in for a lot of criticism over his view that in terms of per capita death rates by violence, stateless societies were (or are) actually much more violent than modern states, even in the 20th century. R. Brian Ferguson has a scholarly refutation of Pinker’s views on prehistoric war in Ferguson (2013a) and (2013b), but these are in a book yet to be published, so who knows if his criticisms have force. Christopher Ryan, “Steven Pinker’s Stinker on the Origins of War,” March 29, 2011. Christopher Ryan, “Pinker’s Dirty War on Prehistoric Peace,” Huffington Post, January 9, 2012. But, if we actually turn to Pinker’s book (Pinker 2011: 49, Figure 2-2; and 53, Figure 2-3), we find that the data compiled there is different from the table Ryan cites, and Pinker does not seem to have made the errors that Ryan points out. I wish to review what Pinker says in his book about violence in stateless and state societies. The purpose of this post is summarise what Pinker actually argues in his book (not in the popular summaries of it). First, some background. Late Pleistocene humans were stateless hunter gatherers. Later these hunter gatherers started to domesticate plants and animals, and pastoral and horticultural/agricultural populations arose. Obviously, agriculturalists tend to the sedentary, but hunter gatherers could be nomadic or sedentary (or seasonally one and then the other). (5) more and more complex state societies (incorporating any or all of the above types of societies). What is being claimed by Pinker is that as populations moved into (4) and (5) above, the per capita level of death rates by violence fell as a long-term trend. Notice how (according to Pinker’s theory) it is not just hunter gatherers who supposedly had a high per capita level of death by violence, but also even stateless agricultural/pastoral populations (a point we should remember). (1) Pinker (2011: 4) notes that “total war” (meaning war where civilians are often attacked and killed in great numbers) is simply not an invention of the 20th century. Many wars in the past have involved massacres of the male population of a community and the enslavement of the women and children. We need look no further than Homer’s Iliad and Odyssey and the Old Testament – some of the foundational cultural and religious books of Western civilisation – to see this: both texts know “total war,” and speak of it as a normal activity (Pinker 2011: 4–12). Indeed god even orders it more than once in the Old Testament (Pinker 2011: 7–8). I might add that even though the events the Bible imagines here – the conquest of Canaan and many other things down to the time of Solomon – are simply fiction (as noted by Pinker 2011: 10), it is the cultural significance of the passages that is important: they indicate that what we would call a type of “total war” was quite acceptable. (3) that fighting in indigenous pre-modern societies was largely ritualistic and often harmless (Pinker 2011: 31–36). Pinker rejects this, and I agree. Pinker also draws attention to an unhealthy political correctness amongst the so-called “anthropologists of peace” who have attempted to unfairly oppose research that disputes their own ideas on the origin of war and violence (Pinker 2011: 43). (3) First, human evolution and the evidence from primates does not support the ideas of the “anthropologists of peace.” Some have argued that the bonobo (Pan paniscus) was possibly like the common ancestor and that humans developed aggression and war-like tendencies subsequently. But Pinker notes the problems with this. First, bonobo non-aggression may be exaggerated, as violence has been observed in wild bonobos (Pinker 2011: 39). Secondly, even if we assume that bonobo aggression is minimal, bonobos are so anatomically different from normal chimps and other apes (through the evolutionary process of “neoteny”) that it is likely that they diverged from an animal more like the common chimps rather than the common ancestor (Pinker 2011: 39). Now Chimpanzees are violent, and fight inter-communal wars (Pinker 2011: 37). In some chimp communities, it has been observed that more than 33% of males die by violence (Pinker 2011: 38). Violence is also observed in other primates. It is not unlikely that it was a trait in the common ancestor and was passed on to Australopithecines and early Homo species. Prehistoric humans certainly had real motives for war: (1) struggle over and appropriation of resources or even theft; (2) what we would now call “credibility” or pre-emption: the need to demonstrate to potential enemies that there will be a price for any violence; and (3) revenge or honour (the use of violence to extract revenge for crimes or insults, real or perceived) (Pinker 2011: 46–47; 56). (4) While Homo sapiens is anatomically 200,000 years old, behaviourally modern humans (with art, clothing, tools, and rituals) are probably about 75,000 years old. Agriculture developed about 10,000 years ago independently in China, India, the Fertile Crescent, West Africa, Mesoamerica, and the Andes (Pinker 2011: 40). Before this humans were all hunter gatherers, but of course the hunter gatherer lifestyle persisted for many thousands of years in some regions, and indeed up until the 20th century in some areas. A crucial point that Pinker makes is that human societies were still stateless after the invention of agriculture, and it was some 5,000 years after the appearance of agriculture that effective states developed (Pinker 2011: 41). Therefore we should not be remotely surprised that stateless or loosely organised agricultural societies should also have high levels of violence. Even the violence of tribal sedentary societies with petty chiefdoms does not really refute Pinker’s thesis. For, quite simply, these societies are not subject to a higher “Leviathan state” that enforces laws and policies behaviour. (5) Pinker draws on a body of work against the naïve modern anthropological successor of Rousseau’s ideas: LeBlanc (2003); van der Dennen (1996); Keeley (1996); Thayer (2004); and Wrangham and Peterson (1997). The “anthropologists of peace” ignore the cumulative causalities of battles (not insignificant), the murderous raiding that some stateless human societies engage in, killing of non-combatants, and the other violent activities (Pinker 2011: 44). (6) Pinker admits that the 20th century in terms of absolute numbers of violent deaths is the most bloody of any century (Pinker 2011: 47). But the linchpin of Pinker’s analysis is his contention that really it is per capita death rates by violence for a society that demonstrate how violent that society is. Certainly this is how modern social science decides such a question: we use per capita homicide rates (per 100,000) to compare one country with another. The crucial question is: if I were a member of such-and-such a society, what would my chances be of dying a violent death in this society? For that, we need per capita death rates by violence (both war and murder). (7) Pinker admits that war was not universal amongst foraging hunter gatherer groups, but nevertheless frequent for many, as data suggest that 65 to 70% of hunter gatherers are at war at least every 2 years (Pinker 2011: 52). Above all, we should look at the per capita death rates for hunter gatherers, hunter-horticulturalists, and other essentially stateless tribal groups, whether agricultural or pastoral populations. World, 2005 (battle deaths): 0.0004% (Pinker 2011: 49, Figure 2–2). Some data on Pinker’s sources: on prehistoric violence, Pinker cites Bowles (2009); Keeley (1996); McCall and Shields 2008; Walker 2001; and Thorpe 2003. On hunter-gatherers, see Bowles (2009). On hunter-horticulturalists and other tribal groups, see Gat (2006); and Keeley (1996). From Pinker’s data, we can see that death rates were quite high in hunter-gatherer societies, and were even higher amongst stateless hunter-horticulturalists and other tribal groups. That might suggest that violence spiked once agriculture was invented, perhaps because sedentary agriculturalists have more to fight over. But the clear trend is apparent once the modern state appeared: a downward trend. (8) The 20th century saw about 40 million battle deaths (soldiers and civilians directly killed in combat). Pinker estimates that 6 billion people died in the 20th century (from all causes natural or otherwise), so that 0.7% died in battle deaths (Pinker 2011: 50). What is more striking is that, if we include all state-based violence, such as genocides, purges, man-made famines, and other human-caused disasters, the percentage rises to 3% (Pinker 2011: 50). That is still lower than sample death rates in stateless tribal societies, whether hunter-gatherers or horticulturalists (or mixtures of the two). (9) So what was the watershed? Pinker argues that it was the “Leviathan state.” The rise of states that incorporated many communities and that imposed law and order and peace upon the populations. But Pinker does not deny that many of these early states were socially and economically stratified, had authoritarian rulers and peace was kept with some very brutal law codes and punishments (Pinker 2011: 57). Pinker is not giving a moral endorsement to early states or all states, but is merely identifying a trend and process that they caused: reduction in violence per capita. 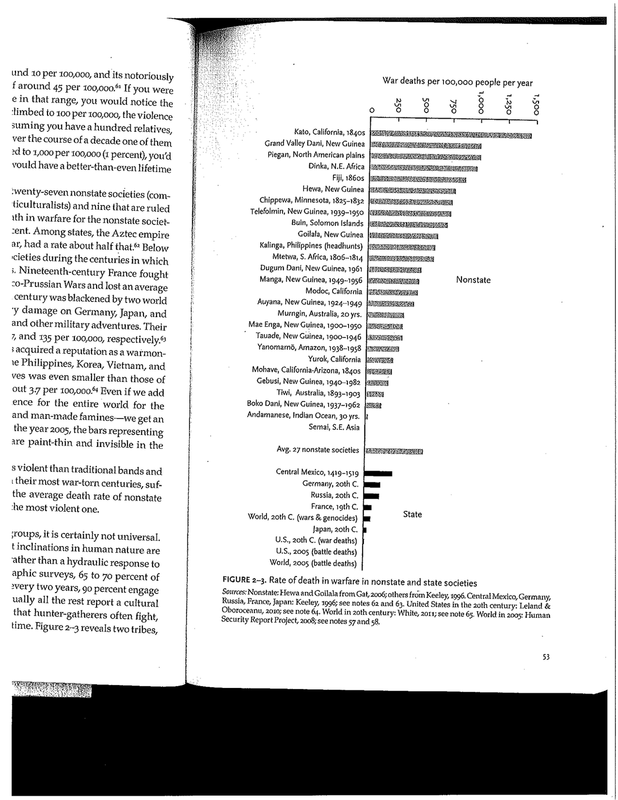 (10) Shifting to a calculation of deaths from war per 100,000 in 27 non-state societies, Pinker comes up with an average of 524 per 100,000 (Pinker 2011: 52). * that is, war, genocide, purges, man-made famines (Pinker 2011: 53, Figure 2-3). A good scan of the whole table can be found over at Gene Callahan’s blog. Communist China (1949-1987): 120 per 100,000 (Cooney 1998: 58). There is no doubt that the Khmer Rouge and Nazi Germany stand out as outliers, the most terrible regimes of the 20th century. But what is astonishing is that even murderous tyrannies like the former Soviet Union and Communist China (in its worst days) were less violent than some non-state societies. (11) Pinker also notes that, even if we are to assume that prehistoric hunter gatherers really had low deaths per capita from violence, that does not contradict his thesis. For Pinker is comparing people in a state of anarchy with state-based societies (where the government has a monopoly on force or at least a significant role in keeping the peace). Those groups living in stateless societies include hunter-gatherers, hunter-horticulturalists, pastoralists, and some agricultural communities. Pinker is not simply comparing prehistoric hunter gatherers with every other society. (12) One important outlier in the 20th century was Cambodia under the Khmer Rouge, possibly the most murderous regime of the 20th century. It is unclear whether this is included in Pinker’s data for 20th century wars and genocides (though I would assume so). Estimates of the total number of deaths range from 1.4 to 2.2 million in a population of around 7 million, and a death toll of perhaps 20-31.42%. But let us assume an even worse upper estimate of 33%. But even that shocking death toll was exceeded by some stateless societies: e.g., the Amazon Waorani (c. 58%). Some stateless societies came close: the Amazon Jivaro (at c. 30%) and New Guinea Gebusi (c. 29%). As a final point and matter of interest, the Amazon Waorani, a semi-nomadic group, seem to have the highest homicide rate ever seen in any modern society (Beckerman et al. 2009): some sources report that 60% of deaths were due to violence over the past century. That is pretty shocking. Gene Callahan, “It Ain’t the State,” La Bocca della Verità, November 20, 2011. Gene Callahan, “The Violence of Pre-State Warfare,” La Bocca della Verità, January 4, 2013. Gene Callahan, “State Policies Never Work? !,” La Bocca della Verità, January 19, 2013. Douglas P. Fry, “Peace in Our Time,” Bookforum.com, December/January 2012. Beckerman, S., Erickson, P. I., Yost, J., Regalado, J., Jaramillo, L., Sparks, C., Iromenga, M. and K. Long. 2009. “Life Histories, Blood Revenge, and Reproductive Success Among the Waorani of Ecuador,” Proceedings of the National Academy of Sciences of the United States of America 106.20: 8134–8139. Bowles, Samuel. 2009. “Did Warfare among Ancestral Hunter-Gatherers affect the Evolution of Human Social Behavior?,” Science 324: 1293–1298. Cooney, Mark. 1998. Warriors and Peacemakers: How Third Parties Shape Violence. New York University Press, New York and London. Dennen, J. van der. 1996. The Origin of War: The Evolution of a Male-Coalitional Reproductive Strategy. Origin Press, Groningen. Ferguson, R. Brian 2013a. “Pinker’s List: Exaggerating Prehistoric War Mortality,” in Douglas P. Fry (ed. ), War, Peace, and Human Nature: The Convergence of Evolutionary and Cultural Views, Oxford University Press, New York. (forthcoming). Ferguson, R. Brian 2013b. “The Prehistory of War and Peace in Europe and the Near East,” in Douglas P. Fry (ed. ), War, Peace, and Human Nature: The Convergence of Evolutionary and Cultural Views, Oxford University Press, New York. (forthcoming). Gat, Azar. 2006. War in Human Civilization. Oxford University Press, Oxford and New York. Harris, Marvin. 1980. Culture, People and Nature: An Introduction to General Anthropology (3rd rev. edn.). Harper and Row. Keeley, Lawrence H. 1996. War Before Civilization: The Myth of the Peaceful Savage. Oxford University Press, New York and Oxford. Keeley, Lawrence H. 2001. War Before Civilization. Oxford University Press, New York and Oxford. Lacina, Bethany and Nils Petter Gleditsch. 2005. “Monitoring Trends in Global Combat: A New Dataset of Battle Deaths,” European Journal of Population 21: 145–166. LeBlanc, Steven A. 2003. Constant Battles: The Myth of the Noble Savage and a Peaceful Past. St. Martin’s Press, New York. McCall, G. S. and Shields, N. 2008. “Examining the Evidence from Small-Scale Societies and Early Prehistory and Implications for Modern Theories of Aggression and Violence,” Aggression and Violent Behavior 13: 1–9. Thayer, Bradley A. 2004. Darwin and International Relations: On the Evolutionary Origins of War and Ethnic Conflict. University Press of Kentucky, Lexington, KY.
Thorpe, I. J. N. 2003. “Anthropology, Archaeology, and the Origin of War,” World Archaeology 35: 145–165. Walker, Phillip L. 2001. “A Bioarchaeological Perspective on the History of Violence,” Annual Review of Anthropology 30: 573–596. Wrangham, Richard and Dale Peterson. 1997. Demonic Males: Apes and the Origins of Human Violence. Bloomsbury, London. Another recent Steve Keen interview. This time with Thom Hartmann, and on Modern Monetary Theory (MMT). These videos are not related to economics, but are a corrective to the myth peddled by libertarians that the modern state has presided over the most violent period in human history. In fact, one would have to say that the rise of the modern state is correlated with a remarkable fall in internal violence (within states) and interstate violence (with notable short periods of regression such as 1914 to 1945). Now obviously one should not deny the role of culture in this process. For example, there was no doubt an increasing cultural repugnance to the fighting of duels in European nations in the 19th century (except perhaps Germany), but it was the state that outlawed dueling and enforced the law, so what we always have is a two-sided process which involves states. Another crucial point is how per capita death rates in war in tribal societies in the modern era – and by induction we can assume historically – appear to have been much higher than in the modern world. The anarchic state of man in stateless societies was by no means peaceful. Even the idea of “total war” is by no means a modern development: it is merely the lack of technology the limited pre-modern societies in waging war. If Middle Ages had access to modern technology, then their wars would have been far more bloody than 20th century ones. Also, just listening to these videos, in terms of how violent punishment and even entertainment used to be in the past (e.g., think of gladiatorial games or bear baiting), one can also say how comparatively civilised we have become in the modern world, compared to our ancestors. And note how Pinker endorses in the first talk (admittedly amongst a number of other theories, not incompatible by any means) the Leviathan state theory: a state-based monopoly on force reduces internal violence. In his book, Pinker (2011) agrees that the “Leviathan state” of Hobbes is in fact a major factor in reduced violence. I wish to make two further points in reference to comments below. (1) First, I am talking about the views of Austrian anarcho-capitalists in this post (like followers of Rothbard), not Mises or Hayek, who both defended the minimal state. “There are people who call government an evil, although a necessary evil. However, what is needed in order to attain a definite end must not be called an evil in the moral connotation of the term. It is a means, but not an evil. Government may even be called the most beneficial of all earthly institutions as without it no peaceful human cooperation, no civilization, and no moral life would be possible. In this sense the apostle declared that ‘the powers that be are ordained of God.’” (Mises 2010 : 48). Edward S. Herman and David Peterson, “Steven Pinker on the Alleged Decline of Violence,” Zcommunications.org, December 2, 2012. To respond to some of the criticisms here, Christopher Ryan points to the allegedly peaceable bonobo as a possible example of what our common ancestor was like, but for reasons given in detail below that is unlikely. A more damaging criticism is that Pinker’s examples of hunter gatherer per capita death rates (from Keeley 2001) are mostly from societies that are not exactly hunter gatherers: most are partly agriculturalists and not the strict “nomadic (immediate-return) hunter-gatherers” who were “most representative of human prehistory.” How Pinker responds to this, I do not know. But a look at other data about the Kung San (Bushmen) or Copper Inuit (both hunter-gatherers) does seem to indicate a high homicide rate and raiding against neighbours (Keeley 2001: 29). In South America, the Yaghan (also nomads) had a murder rate in the late 19th century 10 times that of the US (Keeley 2001: 29). Another criticism is that “there [is] no credible evidence that war characterized human life prior to ‘civilization,’ [and] there is massive evidence that war is among the artifacts forged by civilization.”* I really doubt that. First, what about primates? There is plenty of evidence for inter-communal and interpersonal violence amongst primates. And these animals are closer to the common ancestor than we are. What the common ancestor had was most probably passed on to early humans. “In perhaps the most famous of all ethological studies, the leading authority on chimpanzee behavior, Jane Goodall, extensively observed the chimpanzees of the Gombe National Park in Tanzania and showed that aggression and warfare are part of chimpanzee behavior. In the course of her studies, she watched not only violence associated with the struggle for dominance among males but also significant intercommunal violence, including attacks, murder, and a four-year war between rival communities.” (Thayer 2004: 165). A four-year war between rival chimpanzee communities! The fact that chimps wage wars and conduct violent raids on other chimps, commit murder, and annex new territory by war would suggest that this behaviour may well have been what our common primate ancestor did too. That is confirmed in this video below of Jane Goodall. While bonobos (pygmy chimpanzees) seem to be less violent than other apes (though maybe that is exaggerated), we know bonobos are exceptional primates, and it is far better to look at multiple primate species if we want to use induction to make hypotheses about the common ancestor and hominids: when we do look, we find that violence is a well attested behaviour amongst apes (Sherrow 2012: 34). Do we really believe that Australopithecenes and our various Hominid ancestors lived in a world where war had to be “invented”? That pre-agricultural hunter-gathers and nomads lived in some idyllic paradise imagined by Rousseau, which was then spoilt by civilisation? I find it unlikely. That is the conclusion of H. M. Sherrow: that early hominids engaged in non-lethal and lethal violence (Sherrow 2012 34–35). It is only one step from here to tribes of stateless homo sapiens and their wars where death tolls can build up quickly – and so to the high per capita death rates from violence Pinker argues probably existed in such societies. One final point: actually this finding about war does not contradict that view that early human hunter gatherer groups were also characterised by intracommunal egalitarianism, cooperation and collectivism. * For those who want a scholarly refutation of Pinker on prehistoric war, see R. Brian Ferguson, “Pinker's List: Exaggerating Prehistoric War Mortality,” and “The Prehistory of War and Peace in Europe and the Near East,” in Douglas P. Fry (ed. ), War, Peace, and Human Nature: The Convergence of Evolutionary and Cultural Views, Oxford University Press, New York. 2013 (forthcoming). Obviously, I cannot read and respond to this, because it is not yet published! Mises, L. von. 2010 . Omnipotent Government: The Rise of the Total State and Total War. Yale University Press, New Haven. Sherrow, H. M. 2012. “Violence Across Animals and Within Early Hominins,” in Todd K. Shackelford, Viviana A. Weekes-Shackelford (eds. ), The Oxford Handbook of Evolutionary Perspectives on Violence, Homicide, and War. Oxford University Press, Oxford and New York. 23–40. Below is the data on inflation for the US in the 19th century. In yellow, I have highlighted the periods where price deflation is correlated with recessions identified by Davis (2006) (data from Balke and Gordon (1989) can be found here). In green, I have highlighted the years when there was (apparently) real output growth with price deflation. Now I do not deny that an economy can have real output growth with price deflation. It certainly a myth that price deflation is always associated with recessions. (1) a number of “green” years follow recessions (e.g., 1817–1818, 1824, 1830, 1876, 1886, 1897 and 1909), and perhaps these were merely ongoing deflations caused by the previous recessions not yet finished. (2) the real output data may well be simply inaccurate in the era before 1870: too little is known of real output movement for any definitive chronology. So some of the “green” years may well be recessions we do not know about. For example, there is some evidence that the 1817 to 1821 period was really a recession (Benson 2010: 33). Although Davis’s industrial index only shows contraction in 1816 (Davis 2004: 1189), there seems to have been a contraction of agricultural output c.1817 to 1821, and this must have been a significant part of GDP in this period (since even in 1839 industry only accounted for 22% of US output). (3) Some “green” years seem to have had very weak growth, or essentially stagnation, e.g., 1877 (on the basis of Davis’s industrial index [Davis 2004: 1189]). (4) the 1866–1871 period looks like post-Civil war deflation. Other points of interest are the inflationary recessions of 1836–1837, 1860–1861, 1864–1865 (end of the Civil war) and 1903–1904. But all other periods of real output growth (i.e., booms) are inflationary. So it is perfectly clear that one can identify many periods in the 19th century where price deflation was correlated with recession. Of course, a number of years (especially within 1873–1896) saw both price deflation and real output growth. “I had since 1909 been stressing the fact that deflation tended toward depression and inflation toward a boom.” (Fisher 1933: 350, n.). Davis, J. H. 2004. “An Annual Index of U.S. Industrial Production, 1790-1915,” Quarterly Journal of Economics 119: 1177-1215. Davis, J. H. 2006. “An Improved Annual Chronology of U.S. Business Cycles since the 1790s,” Journal of Economic History 66.1: 103–121. Gallman, R. E. and Howie, E. S. 1971. “Trends in the Structure of the American Economy since 1840,” in R. Fogel and S. Engerman (eds. ), The Reinterpretation of American Economic History. Harper and Row, New York. 25–37.